There's far more to being a Christian than just attending church, handing out Bible tracts and living average mundane lives. We are called to be salt and light to a flavorless, dark world. But while others have been coming out of the closet, Christians have been going underground by retreating into the closet. Jesus never intended for us to go into hiding! Society starts to decay the moment Christians go into retreat. Before Jesus Christ left this Earth, He made it crystal clear through what is called the Great Commission, that we who now believe in Him are to be brand ambassadors for God and for His kingdom. But somewhere along the way, Christians seem to have lost that focus. We now live in an age where Christians have allowed themselves to be smothered by the culture of the age we live in. Believers are suffocating under the pressure of worldliness, susceptible to the peer pressures of ungodliness and compromise. And instead of being influencers for Jesus Christ, we find ourselves instead being influenced by the world against Christ. And God's brand has taken a beating. There also seems to be a confusion in some Christian camps between being contemporary with the world, and being contaminated by the world. Where is the balancing line? Can Christians look and dress just like the world, and still project the image of Jesus Christ? Can we do what the non-believers do, hang out in the places they frequent, and partake in questionable activities alongside them—and still represent the best interests of the Kingdom of Christ? What happened to the power of God? Why does it seem to have gone missing? We hear tales and stories from the past as well as around the world today, where Christians operated in unbelievable spiritual power and influence—opening blind eyes, unstopping deaf ears, curing the lame, diseased and afflicted—even raising the dead back to life again. But what happened to the power? Why don't we see it more often—and more importantly: is there a connection between the power of God that's missing and the current way we've been representing our Lord? These are the questions of the hour. We don't serve a dead God. We serve an all-powerful, eternally existing, supernatural God; one who still desires to work wonders, signs and miracles today! And God is seeking ambassadors through which He can make his power and personality known through today. Will it be you? This powerful ebook will show you that there's more to Christianity than just a mere religion. 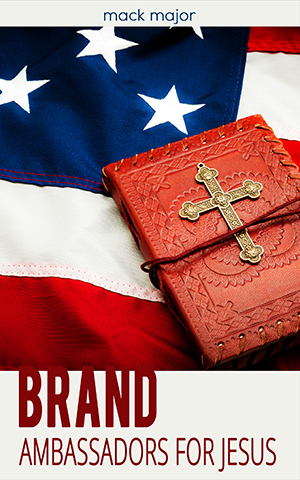 Christianity is also a brand. But it's a brand that has been struggling to find itself; and in some cases struggling to redefine itself in order to remain relevant in an increasingly hostile, anti-Christian environment and culture. But there is a revolution brewing—one that is being kicked off by none other than Jesus Christ Himself. Jesus is stepping in to not only salvage His own image, but to place His stamp of approval in power, signs and wonders on those who are aligned with the principles that His Kingdom and reign stand on. This is not your ordinary book for believers. And chances are you'll never read anything else like it. This ebook is a call to action for the modern believer. It's a manifesto for the spiritually militant—a code of conduct for warriors. And it's the key to you having a fulfilling journey as an ambassador for the Kingdom of God as you spread the impact of Jesus Christ within your own circles of influence. You've been recruited into a spiritual war—and this ebook is your call to duty! Just click the button provided to place your order now.